Ideal to replace your original plugs and adapter to keep away from tangles or cable chaos. AC Plug Adapter: UK 3 Pin Plug. 2.4A per Port. Colour: Black. Ports: 4 × USB 4 Pin AF. - High quality design using market leading electronics and raw materials ensures long lasting performance and reliability. 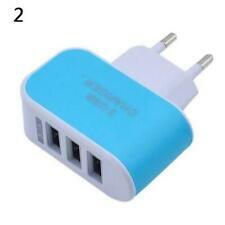 Features: AC wall charger with 4 USB port and US/EU/UK/AU 4 changeable plugs. AC plugs can be removed and changed easily by pressing the button and pull out from the main unit. Supports charge 4 devices at one time through just one wall socket. Designed with blue LED indicators. High efficiency and low energy consumption. Provides standard USB 5V and max. 2.1A output. Compact and light weighted, easy to operate. Every country supports different kinds of sockets, which is an issue faced by frequent travellers. Use only with Fuse T6.3A. 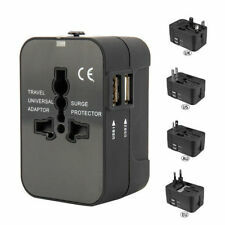 New Multifunction World Travel Universal Power Outlet Adapter. Type: Converter. Features: 100% brand new and high quality 5 ports smart charger design It can charge for 5 devices at the same time With Smart chip Red and blue LED display Safe and fast charging Widely compatibility: compatible with most of the devices Item Specifications: Product Name : 5-port USB desktop digital display charger Material: ABS PC fireproof plastic Product Type: Direct Charge Input: AC 100~240V~0.5A(1.0A)50-60Hz Output: DC5V 4A (single port output up to 2.4A) Plug Type: UK Packing list: 1 x 5-port USB Charger. Features: - Applicable to all kinds of mobile phones, MP3, MP4, camera, iPod, etc. - There is LED work instruction when the product works. - This product includes timely protection against overload and output short-circuit protection measures to make the product safer and let you use it with confidence. 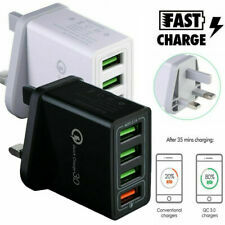 - Owing to super compatible, one charger meets more needs. - The power cord can be twisted arbitrarily and the length is 1.5 meters/4.92ft, which is convenient for your use. Features:Lightweight and Portable 4-USB Charger;Output Voltage 5v Output Current 1A; 2.1A; 2.1A; 2.1A.Inbulit IC protection;Smart current protection and automatic identification.2.1A synchronous rectifier charging;built-in high efficient circuit, Synchronous rectifier, to charge devices safely. Multiple protection, safety and security; Omni compatibility for More Devices: iOS, phone, digital devices;only need one charger .Smart Shunt Current;Worry free to devices,2 Different currents port to ensure your devices not be damaged due to overcharge or insufficient current. 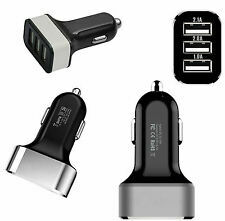 Fast charging technology, double time-saving ,4-port charger and built-in smart chips ,to charge with high efficiency and more time-savingFlameresistant material, quality warrant;Anti. Features: 100% brand new and high quality 1.Large LCD Disply Adapter Charger With 8 Port!!! 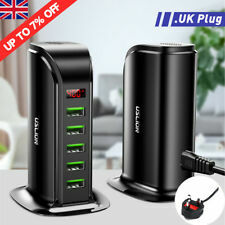 2.Quick charge technology: 8 usb port travel charger, no need to wait!!! 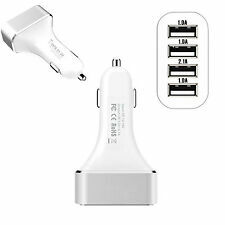 3.8-Port USB Charger: can charge up to 8 devices simultaneously, suitable 4.for various cell phones, iPad, mp3,and so on. Charging together without any mutual interference!! 5.Charging Safety Guaranteed: Short circuit protection, overcurrent protection, overvoltage protection, over temperature protection, anti- 6. static protection,Multi-layer charging protection to ensure equipment safety during each charge ABS flame retradant material, high temperature resistance Real-time current, Real-time voltage, battery 7. level to show charging process Portable size, easy to carry Quick Charge Tech 8.Fast charging, improve efficiency an. Mushroom Lamp Size: 11 11 16 cm. 【Safey Certificates】USB Charging Station CE / RoHS / FCC Certificates,Overheating and short circuit protection, Suitable for modern household and office use. 1 x 5-port USB charging station (base). CE Approved, Unique design fits Wall socket in UK market. 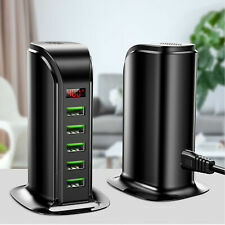 6 USB ports: Single-port USB output maximum 3.5A, 6 USB ports total maximum output 6A. Smart convenience. Cable length: 125 cm/ 50 ". 1 Power Cable. Output: DC 5V 30W in total. This main plug adaptor is simple and easy to use, just plug into any single socket to turn it into a double socket. 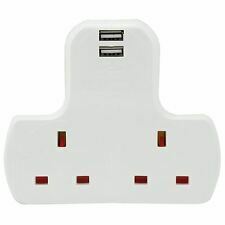 1 x 2 Gang 2 USB Port Multi Wall Adaptor. Made from high quality grade materials for extra safety, the 2way adaptor has been fully tested and approved to conform to British safety standards: BS1363-3 and EN61000-3-2. For various cell phones, iPad, mp3,and so on. Charging together without. level to show charging process Portable size, easy to carry. Color: White. (4) Local pick up is not available. Size: 138X75X50mm.